Rome was ruled by many rulers but the achievements of some far exceeded that of the others. A statue of Constantine, a Roman Emperor. Many rulers reigned over Rome, some of whose achievements superseded those of others. The Roman Empire thrived from 27 BCE with Rome as its initial capital. It rose to be recognized as the most extensive political and social structure ever witnessed in western civilization. The Empire's territorial conquests led it to as far as Asia and Africa. The Empire thrived for almost 5 centuries, a feat that can be attributed to some of its greatest emperors. Augustus was born in 63 BC to the senator Gaius Octavius and a niece of Julius Caesar named Atia. After he was adopted by Julius Caesar, the young Gaius Octavius styled himself as the new Caesar. He set about consolidating authority after Caesar's assassination by eliminating Cleopatra and Mark Antony. During his reign (31 BC-14 AD), Octavius implemented various reforms. Power was shared with senators in addition to magistrates elected yearly. He adopted the honorary epithet ‘Augustus' and established control over provinces with armies. He oversaw the implementation of regular pay as well as terms of service for soldiers and created a pension scheme for veterans. All of Augustus's achievements facilitated the transformation of the Roman Republic into an Empire as he evolved into the first emperor. 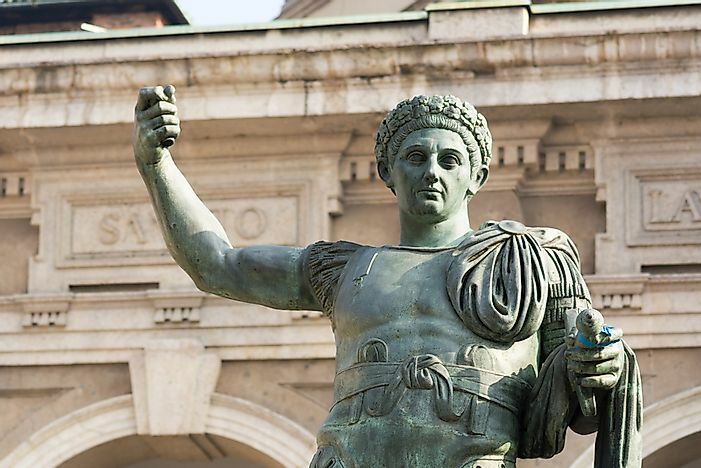 He is credited to have founded the Roman Empire in 27 BC. Vespasian was born in 9 AD as Titus Flavius Vespasianus. Vespasianus made history as the first emperor not descended from the Augustus’s Julio-Claudian family line. A law had to be passed to bestow imperial authority on him called the Lex de Imperio Vespasiani. He ruled from 69-79 AD, a period marked by peace, focus on the provinces, and stability of the imperial finances. Vespasian was also known for his sense of humor and humility. Born Publius Aelius Hadrianus in 76 AD, Hadrian was adopted by Emperor Trajan. Trajan had groomed Hadrian to succeed him and had selected him for several military and civil positions. Trajan's legacy featured territorial expansion via warfare and Hadrian worked to consolidate the territories and establish peace. Hadrian visited all of the Empire and commissioned the construction of such masterpieces as his villa at Tivoli as well as the Pantheon in Rome. He established the empire's frontiers prompting an end to imperial expansion. Hadrian also left a legacy in other territories including the stone wall in Britain named after him. Marcus Aurelius, born in 121 AD, had already been identified for succession by Hadrian while he was of tender age. Several years after the beginning of his reign in 161 AD, Aurelius led war campaigns on the northern frontiers where he drafted philosophical meditations. During his reign, civilian administrators and army officers were promoted on merit instead of class and noble birth. Aurelius appointed people to positions according to their abilities and in doing so facilitated social mobility. At the time of the assassination of Commodus, Septimus Severus was serving as the governor of Upper Pannonia. To consolidate army support, Septimus offered the soldiers a pay rise and gave them more privileges. Severus also set apart the imperial family as sacrosanct, an innovation which was embraced and modified by Aurelian and Diocletian. Constantine was born to Constantius I and Helena in the period between 271 and 273 AD. He was raised up in a time close to anarchy. Diocletian, in late third century AD, implemented a system of Tetrarchy featuring two senior emperors aided by two junior emperors. Although the system was aimed at fostering stability, it triggered wars and rivalries in which Constantine assumed a significant part. Constantine succeeded his father in 306 AD as emperor. In a show of might, Constantine invaded Italy and brought down Maxentius. As sole emperor, Constantine elevated the status of the Christian Church. He ordered the transference of the capital from Rome to Byzantium which he renamed Constantinople.